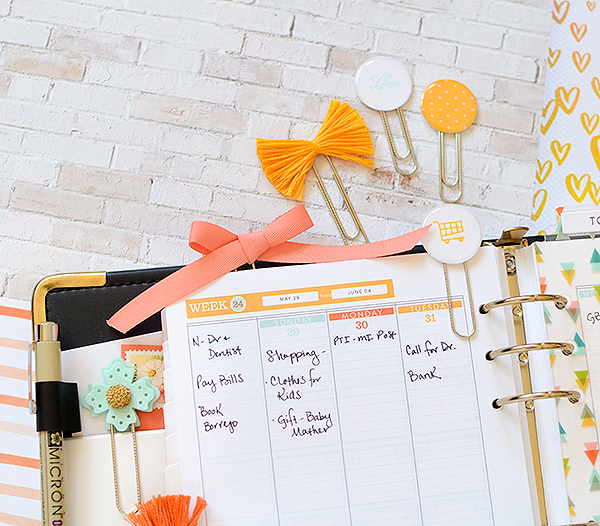 There is a definite planner clip craze happening and I readily jumped onboard. 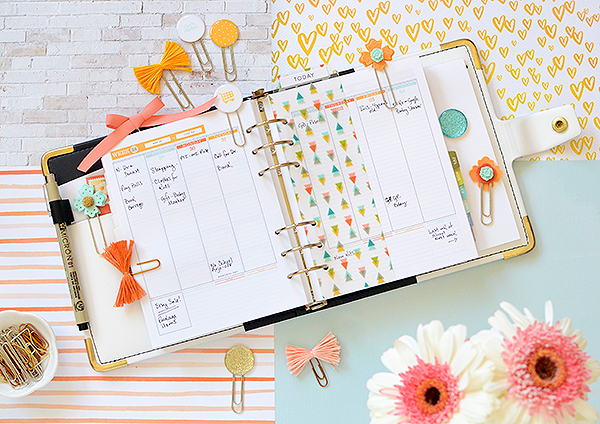 Anything and everything can be fashioned into a fun or pretty clip. 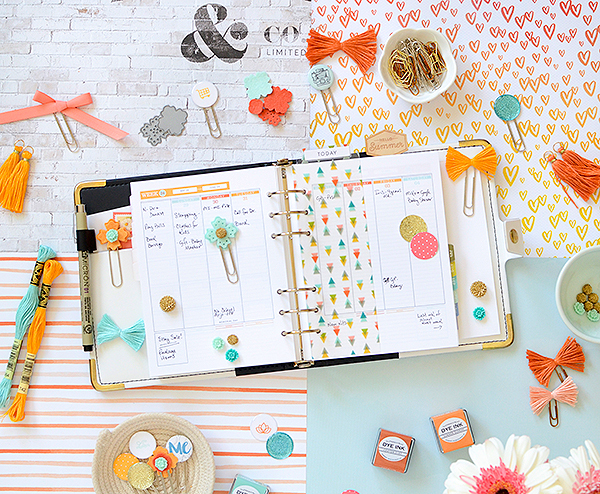 I have a few easy ideas for you in today's post--and I mean, they're really easy! 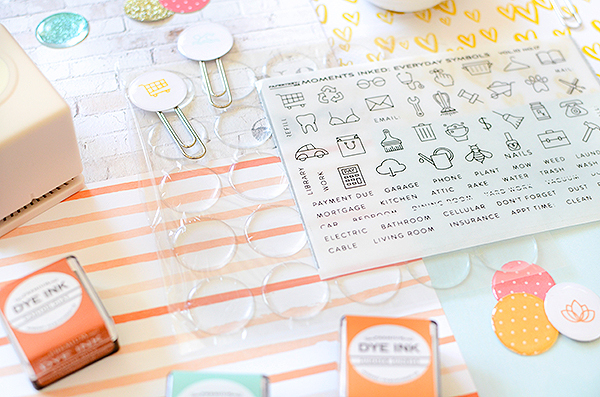 Settle in for a quick look at the way-too-many clips I made to decorate my Papertrey Ink Moments Inked binder! I based my clips on June's Moments Inked colors: Aqua Mist, Canyon Clay, and Summer Sunrise. 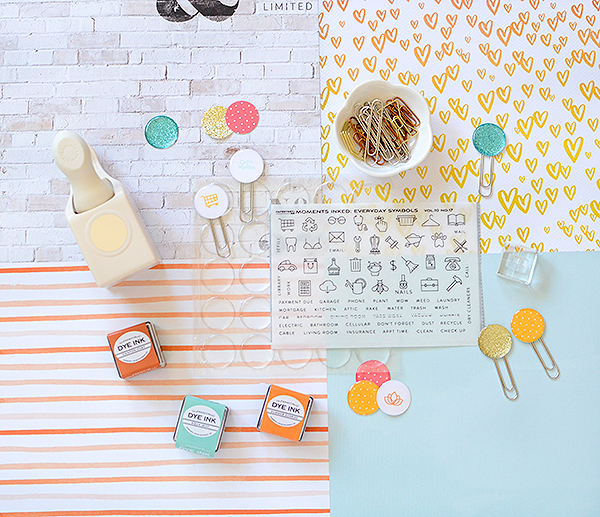 This is a fresh, summery palette and (as always) the colors will coordinate throughout the rest of the year since PTI colors go so effortlessly together, Plus, there's always an excuse to make more in new colors if I want to (and I probably will)! I turned a few of my scrapbooking embellishments into clips with a bit of glue--things like wood veneer and badges. The possibilities are endless so I won't really go into all of the things you can glue to a paperclip. 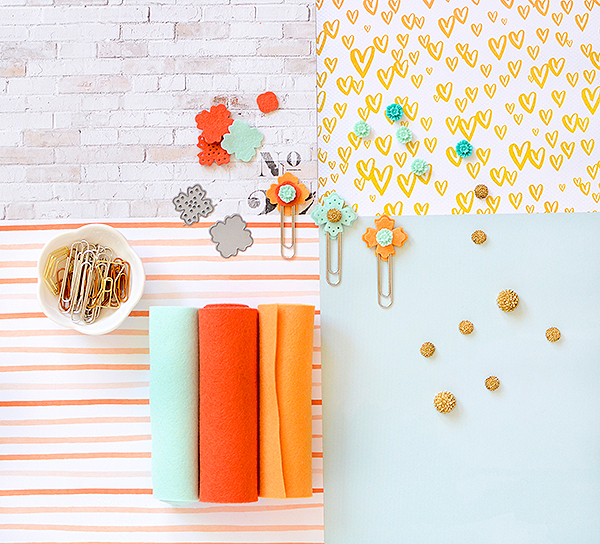 I'm focusing mostly on a few quick DIY's that you may not have thought of. Let's start with epoxy stickers. These are awesome and I've only really just gotten around to trying them out. They're relatively inexpensive (I bought mine from Amazon), a breeze to use, and I can't believe I was so late to the party on these! I'm using the 1" size and the first thing I did was punch a few 1" circles of patterned paper. All you do is then adhere the epoxy sticker on top of it. It's that simple! Next up is ribbon and embroidery floss. 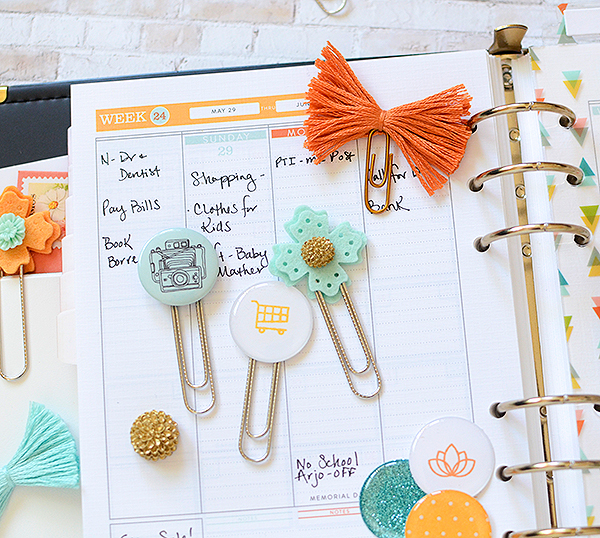 I've been obsessed with making embroidery floss tassels for months; in fact, I blogged about them in my MI planner last year. I slip a jump ring through the 2 looped ends, tie off with thread, and then trim each end about 2 inches down. After making 2 tassels per skein, I'm left with a small chunk which always seemed like a waste to throw out so I decided to make little bows with the remnants. I tie a piece of floss around the middle and it's done. 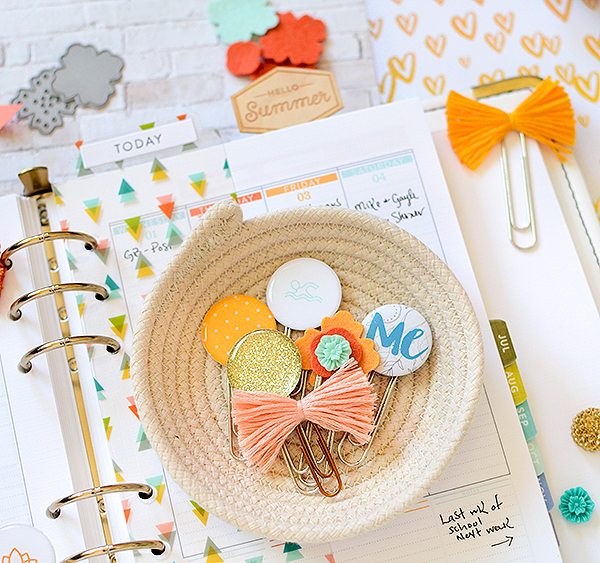 For the paper clip bows, I just tie the floss around my remnants and the top of the paperclip. It takes about 30 seconds! For the ribbon clips, I just tie the ribbon onto the clip, fashioning it into a bow. Done. I used the gorgeous Melon Berry Twill here. 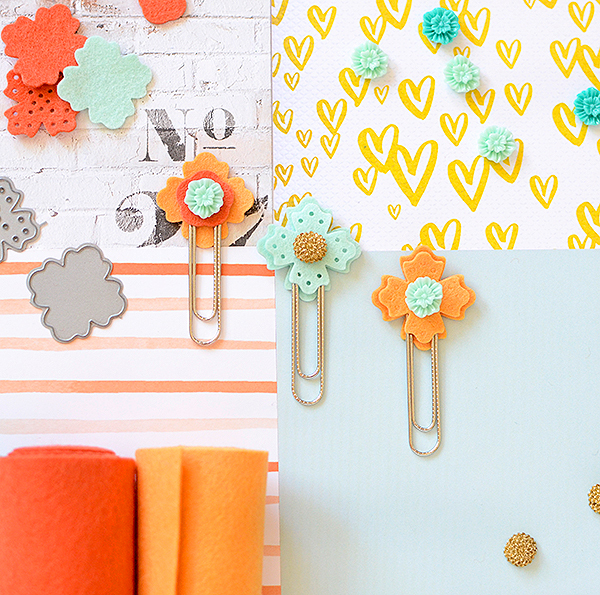 Finally, how about some pretty felt flower clips? I chose flower dies from the Sewing Staples Quick Stitch Kit (PTI has many other flower options, here) and cut a few flowers from PTI felt. Their felt is 100% wool and cuts so clean--plus, it's available in most of their signature colors. After cutting my flowers, I chose different pairings and adhered them to my paperclips. With 2 nested flowers each, I glued one to the back of the clip and the smaller to the front. The final touch was adhering cabochons to the top. 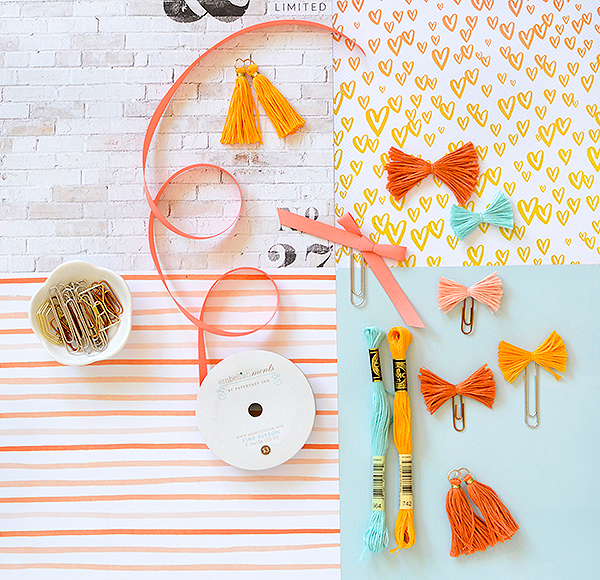 You can also sew these onto your clips, if you'd rather. 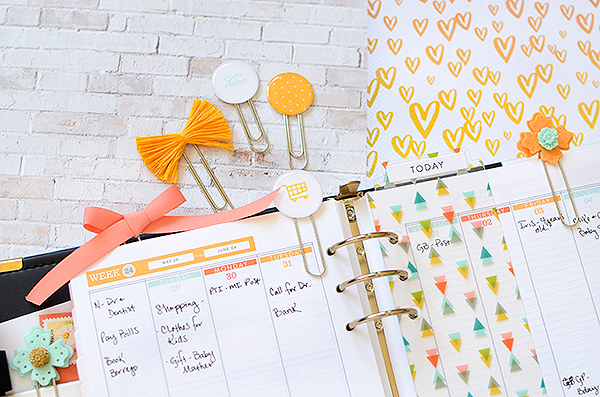 These paperclips will definitely brighten up your planner or office space and they hardly take any time at all. They're a terrific handmade gift for friends, too! Thanks for stopping by and if you try any of these ideas, do let me know how you make out. I'm happy to answer any questions, too. Enjoy your week! Rebecca,this post made me so happy,just fun to look at ! Thank you for sharing all your tips and link to stickers! I thought for sure you used Glossy Accents! Beautiful pictures and clips! Thanks for the great ideas. I better get work! I need these! Se ven hermosos. Gracias!. I will try it and thanks for your ideas!